Donald Brown passed away peacefully on Jan. 18. He was 95. Don Brown passed away on Jan. 18. His funeral will be on May 18. Born in Brooklyn, New York in 1923, he was the son of Samuel Raymond Brown and Theophelia Parrett Brown. He grew up in Glenbrook and graduated from Stamford High School, where he was vice president of his senior class in 1941. Don enlisted in 1942 and served in the Marine Corps, subsequently attending Princeton University and graduating in 1947. In 1948 Don joined Irving Subway Grating Co., where he started his career in sales. He was president of Irving when it was acquired by Harsco Steel Corporation in 1966. His years at Harsco, as divisional President for IKG Industries, took him to Mexico, South America and Europe establishing manufacturing factories producing and selling steel, aluminum and fiberglass flooring to the world market. Don raised his family in Darien and retired here in 1985. Don was predeceased by Georgie, his beloved wife of 68 years; his sister Ruth Hughes; and a brother, Richard Brown. He is survived by his three children: Nancy Condon (Jay), Patricia Kinnunen (Peter), and Keith Brown (Wendy); his eight grandchildren and 12 great grandchildren, who lovingly knew him as “Pop”; a brother, Bruce Brown; and many close nieces, nephews and extended family members. Don will be remembered for his smile, indelible spirit and booming voice, as well as his generosity and kindness. His philanthropy went well beyond his service to the community as he was always ready to lend a helping hand to anyone who needed it. Don and Georgie were active members of the First Congregational Church of Darien for over 60 years, serving on every board and making lifelong friends. Some of Don’s other volunteer commitments were to Person-to-Person as the “van man” picking up and delivering furniture for many years, Meals on Wheels, Red Cross, United Fund, and Pilgrim Towers. Don and Georgie enjoyed traveling with friends and made many more on each trip they took. Don’s energy and happy spirit were contagious. The Brown family were all passionate about skiing, and Don was known as the “Brown Bomber” as he swooped down the mountains of Vermont and the ski areas out west every year with his “over 70” buddies. His last best run was at 85 years old when he joined a grandson at Vail and they skied the back bowls together. 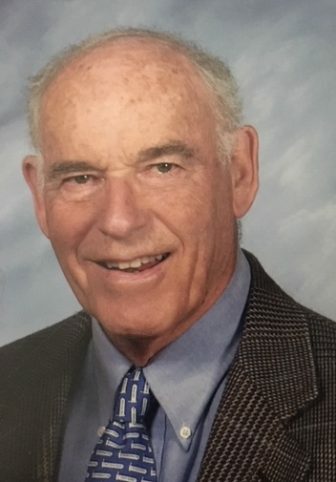 A memorial service will be held in his honor at 2 p.m., May 18, 2019 the First Congregational Church of Darien. Donations in Don’s memory may be made to The First Congregational Church of Darien, 14 Brookside Road, Darien, CT 06820 or Person-to-Person, 1864 Post Road, Darien.